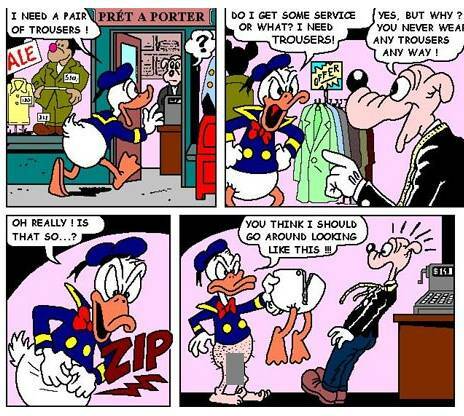 Does Donald Duck wear pants? “How come Donald Duck doesn’t wear pants, but still he wraps a towel around his waist when he walks out of the bath?” This fundamental question has intrigued inquisitive minds inside as well as outside the circles of Academic Donaldism for ages. My personal guess is that while the feathers cover his private parts perfectly as long as they are dry, they fail to do this when getting wet. Probably just because of a change in the feathers’ physical structure, just like wet hair is more see-through than dry hair. Although I also have a lot of sympathy for the classical Oldigs-theory that male Ducks experience a genital change (for the bigger, so to speak) when exposed to water. 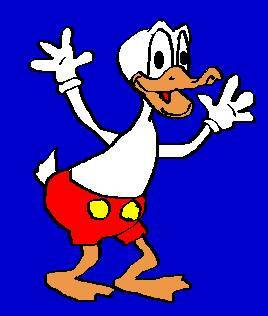 Now, however, I note with great interest that research stipend-holder N.H. Hanseand at SAD has turned the whole discussion upside down with a new sensational discovery: Donald Duck apparently does wear pants! Hanseand has found evidence that Mr. Duck on more than one occasion is seen with his hands put in what appears to be pockets. Thus, Hanseand concludes, this also has to mean that he (Mr. Duck, that is) wears pants. Pants that just look like (or are made of) white feathers and in the shape of very tight shorts, somewhat like the type used by football players in the mid-eighties (without the feathers, though). Hanseand: Går Anders And med bukser? Strictly speaking, other explanations might also be possible, such as Donald just puts his hands in between the feathers on his lower body when cold or tired - as I completely want to refrain from any guessing on whether placing his hands there might also bring about any supplementary pleasure apart from warmth and rest! However, the alternative sources of Donaldism also offer a second piece of evidence, which apparently contradicts the observations of Mr. Hanseand and the duckumentary referred to above. It is a story, also found on the internet, which apparently claims to be taken out of Mickey Mouse’s biography or some similar kind of published memories. In this, as in all successful biographies, he delivers a number of “saucy” inside information about his close friends, among them Donald Duck. The tale in question allegedly refers to evenings at strip clubs visited by Mr. Mouse and Mr. Duck together: »Sometimes the girl would be so high that she almost got to the end of the lapdance before realizing that Donald wasn’t wearing any pants...«. The story is even accompanied by a photo of what seems to be Mr. Duck on the scene (or rather, enthusiastically watching the scene). I will leave it for my esteemed colleagues to judge the academic validity of the two presented exhibits, but as open-minded scholars, I think we at least ought to include them in our initial considerations before reaching to any conclusions. And if no one else will, then let “The Crazy Dutchman” be the one to throw them into the debate. Rector of the Academy has only agreed to reproduce the last scene of the tale with a central piece of censorship inserted, but the male..sorry...main point should still be evident.